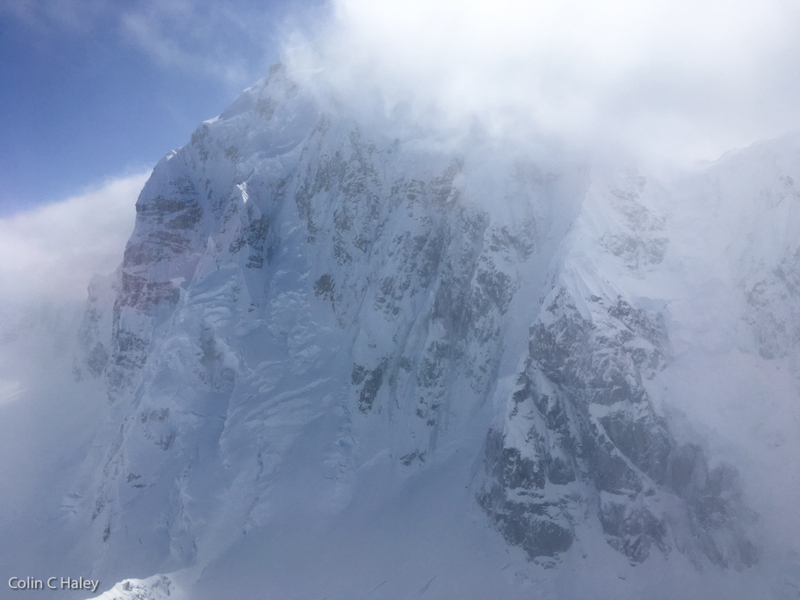 The summits of Begguya and Denali visible from a TAT windshield as Paul Roderick flew Mark and me in to basecamp. The odd appearance of the plane’s propellor blades is the result of the fact that digital cameras use a “rolling shutter,” in which different parts of the image are recorded onto the sensor at different times, rather than all at once, like on a piece of film. 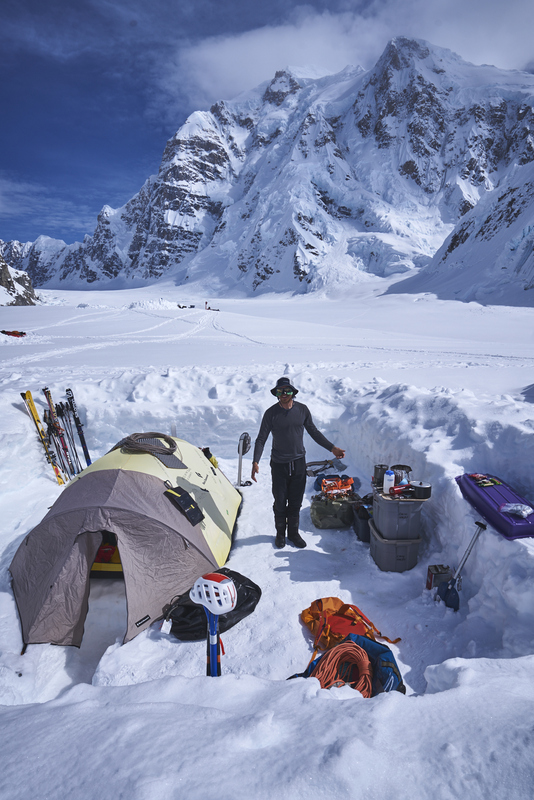 I’ve just returned to Seattle from a trip to the Central Alaska Range, which was shorter than most with only two weeks of camping at Kahiltna Base Camp, but more successful than some Alaska Range trips I’ve done three times the length. 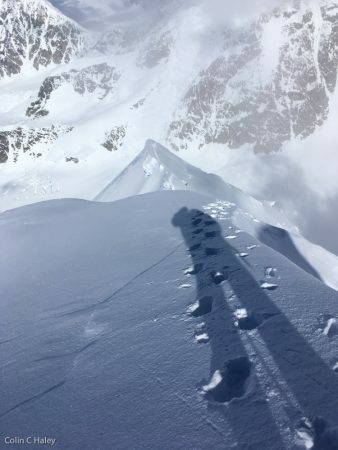 In May 2012 I attempted to solo Begguya (the third-highest peak in the Central Alaska Range) via the North Buttress, and in a state of extreme exhaustion I turned around and descended only 100 meters below the summit. 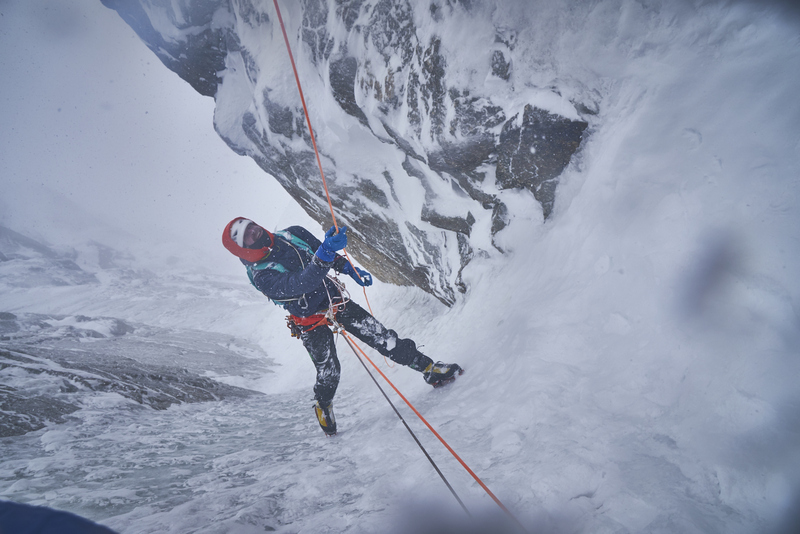 It is the only time in my life that I can recall turning around on an alpine climbing objective not because of weather, not because of conditions, not because I lacked the right equipment, but simply because I was too exhausted to safely continue. My movements were getting sloppy, and I was worried I might fall. The story of that attempt is here: http://www.colinhaley.com/solo-attempt-on-north-buttress-of-begguya/ One hundred meters is not a lot of remaining mountain, especially on a route that gains about 2,000 meters in total, but since it was an objective that I really cared about, like our first attempt on the one-day Torre Traverse with Alex Honnold, I knew I wouldn’t feel satisfied with that near-miss. So, in the past five years I have thought often about going back and finishing what I nearly accomplished in 2012. In the end, I’m actually somewhat happy that I didn’t succeed in 2012, because in the intervening years I have progressed significantly as a climber, and thus the style of climb that I finished is one I’m more proud of than the style of climb I nearly completed five year earlier. 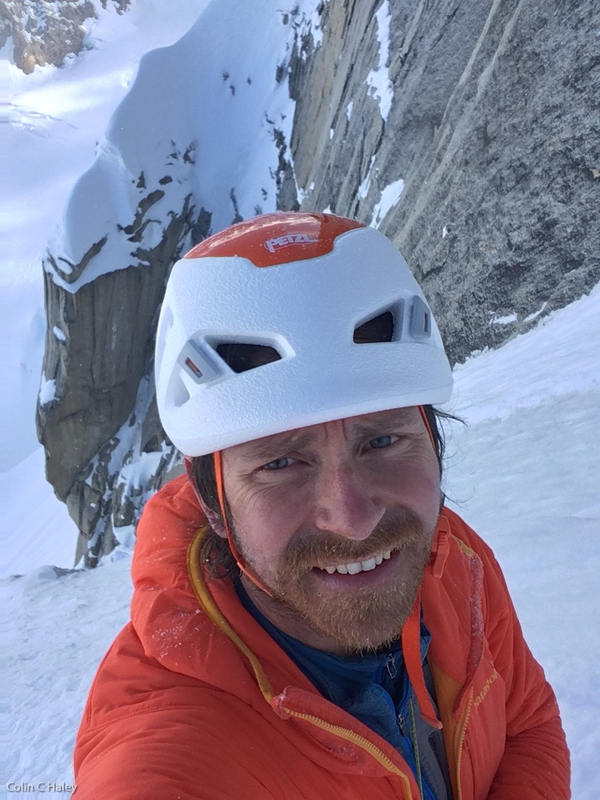 I do really love solo climbing, especially on the right objective, but I’m not some sort of extreme introvert, and the biggest disadvantage in my mind of solo climbing is missing the camaraderie of a good partner. Thus, from my perspective I had a pretty ideal arrangement on this trip: I first got to hang out and do some good warm-up climbing days with a couple good friends of mine, Mark Westman and Mikey Schaefer, and then got a window of good weather for my solo objective almost immediately afterwards. So, the perfectionist control-freak in me got to have my special solo experience, but the socialite in me also got to have a good time with good friends. 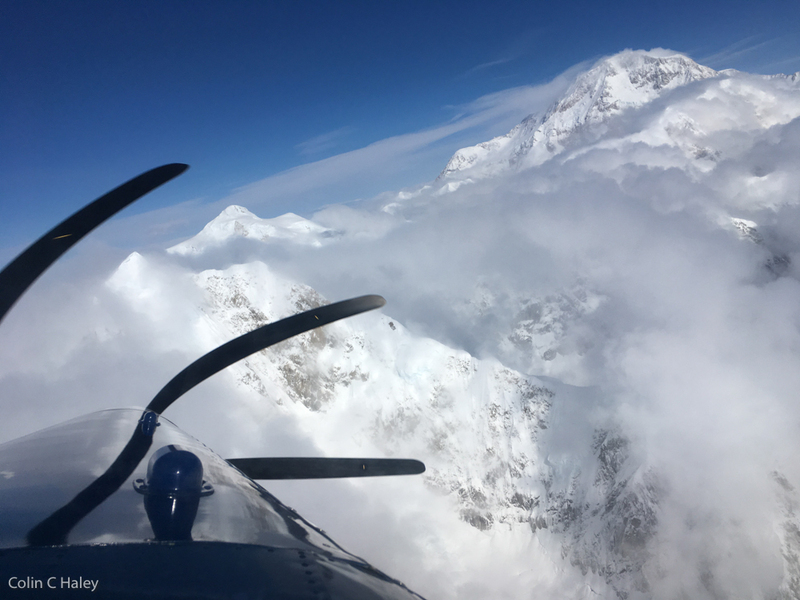 I flew into Kahiltna Basecamp on April 29, with Mark Westman, his wife Lisa Roderick, who is the Kahiltna Basecamp manager, and a few others who joined us in helping to set up Lisa’s basecamp for the Denali climbing season. Mark had just a few days off from his work as a Denali climbing ranger, and the weather wasn’t great, but on May 1st we got out for a fun day of climbing on “Bacon and Eggs,” a route on the “Mini Mini Moonflower” that Mark established several years ago with Eammon Walsh. 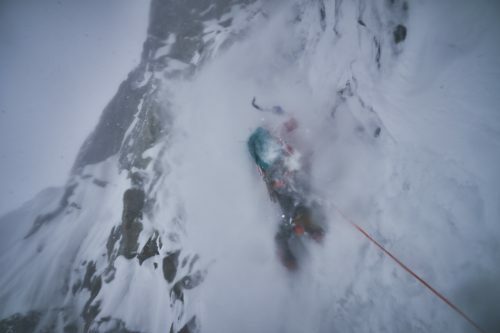 It was a mellow day out, and when it started snowing and spindrifting we started rappelling, rather than continuing to the top of the peak, but it was a perfect first warm up with an old friend. 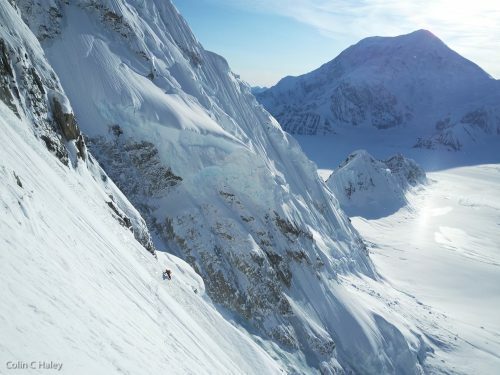 A couple days later Mark flew out to Talkeetna, and my friend Mikey Schaefer flew in. Our plan was to “get two birds stoned at once,” doing some fun climbing that would be more of a warm-up for me and a new experience for Mikey (he had never been to the Kahiltna before), and also get some photos for Patagonia of a couple new jackets (Mikey is a professional photographer in addition to a very good climber). Mikey is a much better rock climber than I am, especially on technical granite, so I have had some memorable days getting rope-gunned around Index or Yosemite with him. The Kahiltna Glacier being a place that is much more my realm than Mikey’s, we had a role reversal, and Mikey had the pleasure of getting dragged around somewhat out of his element, all while trying to get some good photos. On May 5 Mikey and I went “cragging” on the lower portion of Begguya’s North Buttress, climbing Deprivation up to the first ice band, and then rappelling back down on the lower portion of the Bibler-Klewin route. 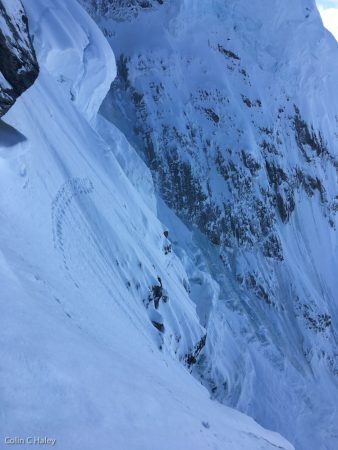 For me it was somewhat of a reconnaissance to see what conditions were like on Deprivation – Having attempted Deprivation in 2011 to the “cornice bivy” (that story here: http://www.colinhaley.com/kahiltna-2011-easy-peak-bagging-and-single-push-failures/), I thought it might be something I would be comfortable free-soloing when in really good condition. However, the crux pitch on Deprivation was in more difficult condition than it had been in 2011, and I quickly concluded that I wasn’t interested in free-soloing it. Above Deprivation’s crux pitch, we had an odd experience of dealing with the mess left behind by a siege attempt on Deprivation in 2016. 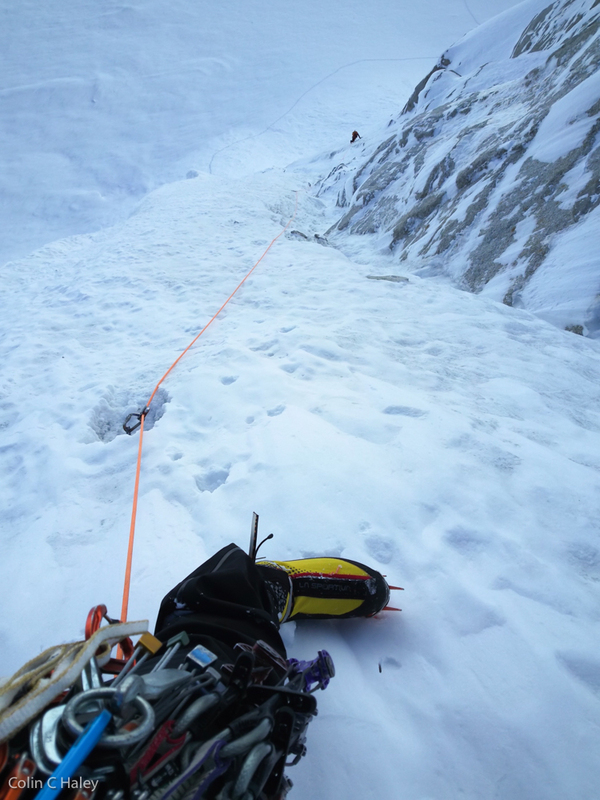 Two ropes had been fixed through the crux, and unfortunately were far too frozen into the ice to be removed. We did some properly altruistic work of carrying down random junk (such as 3 packs of cigars and 3 tins of snus! ), and also some more selfish work of booty-ing some nice climbing hardware! Some of that booty climbing hardware I promptly left on our descent, setting some bomber rappel anchors on the lower pitches of the Bibler-Klewin. Even though we had two 60m ropes, I intentionally set several rappel anchors only 40m apart, knowing that I planned to take a single 80m on my solo attempt, and hoping to avoid carrying a bunch of pitons with me on my solo attempt. 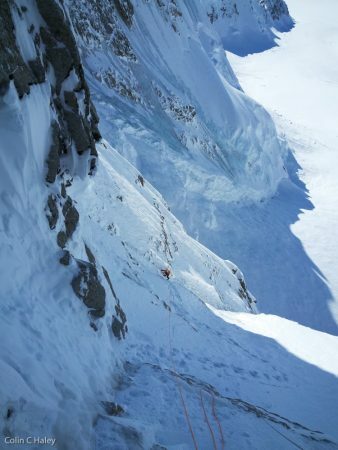 I think that this “prepping” of rappel anchors is the biggest concession of style of my eventual solo ascent. After a day of rest, Mikey and I had a second climbing day on May 7, in which we climbed most of the way up the “Mini Moonflower.” It was snowing heavily, and torrential spindrift is one of the reasons that we decided to descend just below the summit ridge, but at least stormy weather made for some good ambiance for Mikey’s photographic agenda! 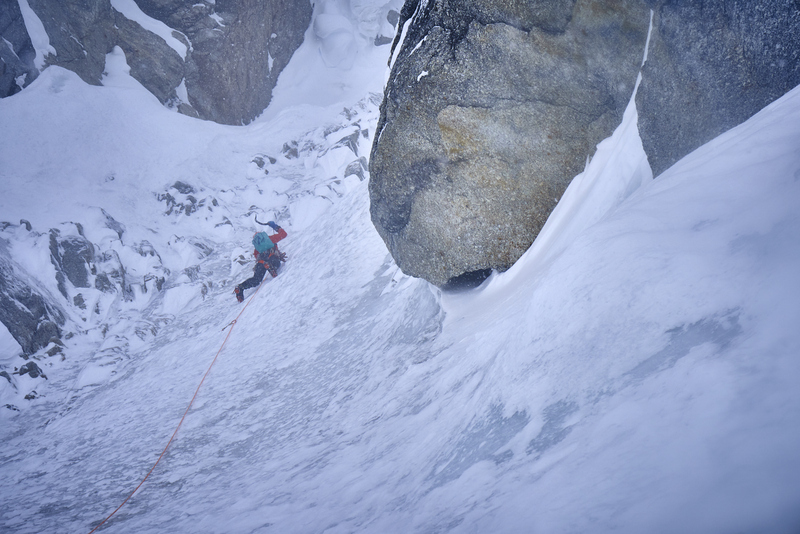 We passed a couple days of stormy weather on the 8th and 9th, and racked up to go “cragging” on the North Buttress again on 10th, perhaps even as high as the cornice bivy. Unfortunately, Mikey woke up quite sick on the morning of the 10th, feeling like crap and having been feverish all night. We scrapped our climbing plans, and Mikey flew back out to civilization. In hindsight it was a blessing in disguise, because I eventually made my solo ascent in a good window of weather on the 12th, and if I had climbed as high as the cornice bivy on the 10th I would’ve likely been too tired on the 12th. On the 12th I woke up around 4:30am, didn’t bother starting the stove because I had made all my warm water the evening before, and after a bit of breakfast departed Kahiltna Basecamp at 5:06am. 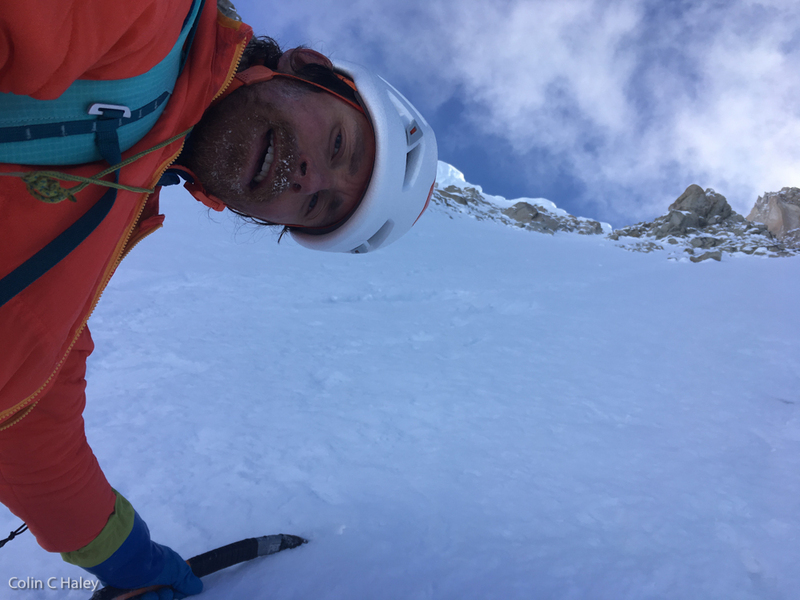 I skied up to base of the North Buttress, swapped my skis and poles for all the climbing hardware I had stashed the morning before, and at a deliberately relaxed pace labored up to the bergschrund, which I crossed at 6:35am. Through the first rock band I climbed on essentially the same line that I had established in 2012, and while I’m sure it is the easiest route through the first rock band, it still contained two bits of trickier climbing, which were the most technical of my entire ascent. 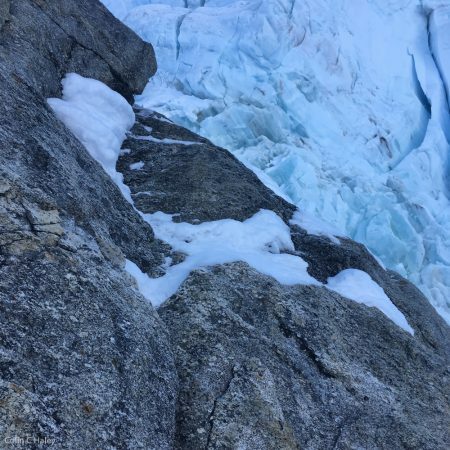 The first was a sort of dihedral between rock and serac ice, climbing with my left foot and hand on rock, and my right foot and axe on ice. It was only a few meters high, but definitely required slow, careful climbing for me to do safely. I don’t remember this bit from 2012, so it may be that at that time there was a flow of ice in this location, or perhaps I went a slightly different way. 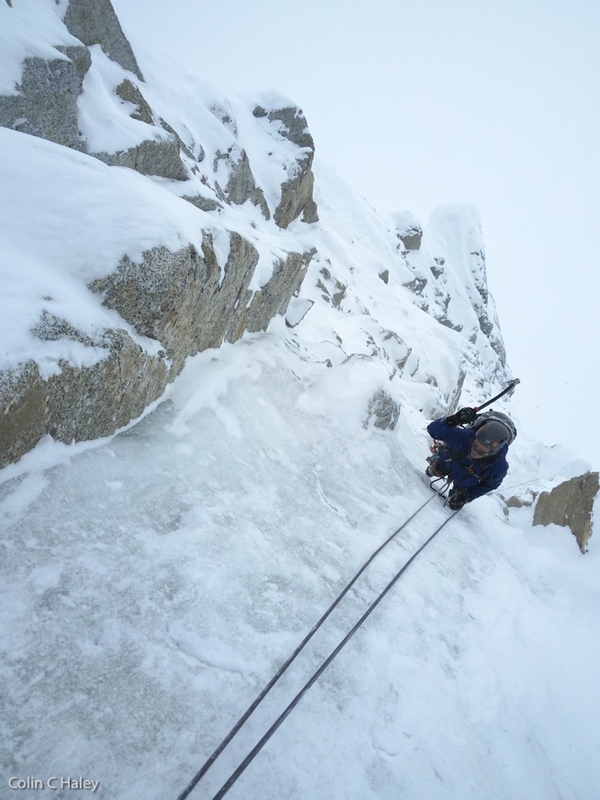 The second bit of tricky climbing was a few meters of rock at the top of the rock band, to exit onto the first ice band. Here I’m quite sure I went in the exact same spot as in 2012, as I recognized the features. 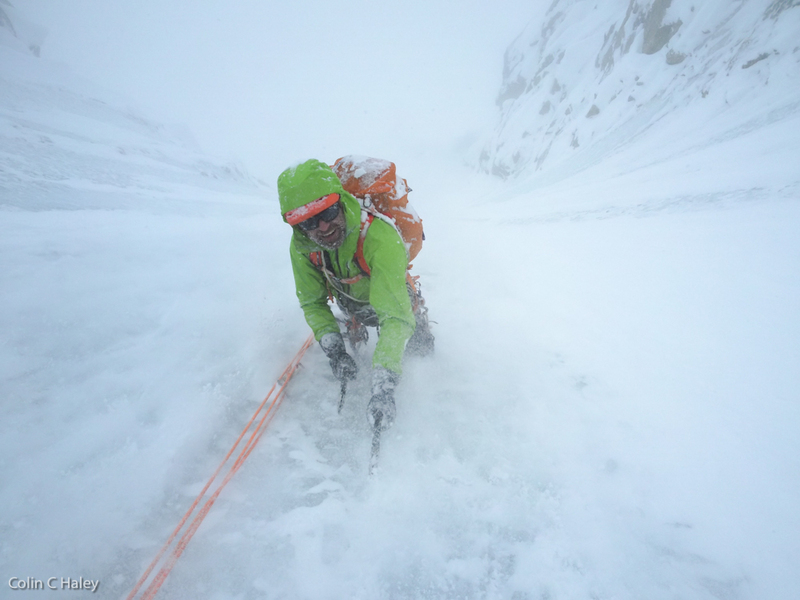 I was established on the first ice band by 7:44, about 70 minutes after crossing the bergschrund. My line through the first rock band is admittedly exposed to some serac hazard, but I’d estimate that I was only in a dangerous area for about 40 minutes – a total exposure to risk that is, in my opinion, massively less than the average party traveling up the Northeast Fork of the Kahiltna Glacier, or even the average party climbing the normal route on Mont Blanc du Tacul. I labored up and left on the first ice band, to link up with Deprivation at the base of the second rock band. There was dramatically less ice in the second rock band than there had been in 2012, but fortunately the climbing remained easy, moderate ice. At about 9:00 I arrived on the second ice band, and started making a big, long traverse to the right, to eventually join up with the upper portion of the Björnberg-Ireland route. 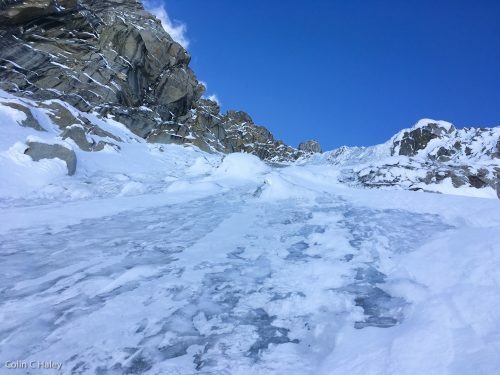 After joining the Björnberg-Ireland I was again exposed to serac hazard for a short period, but I deliberately increased my pace here, and was out of the dangerous area in less than 30 minutes I would guess. 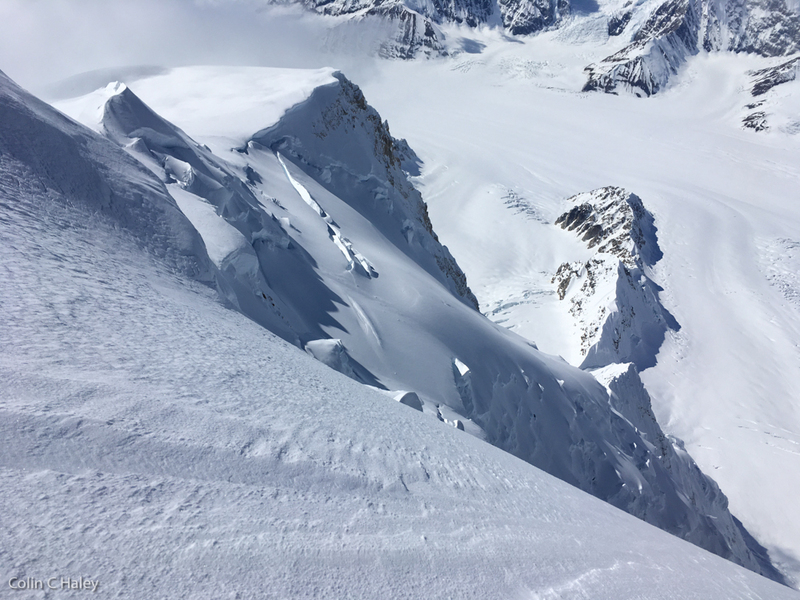 In 2012 I had followed the Björnberg-Ireland all the way to its junction with the original Japanese Northeast Ridge route, but the top of the couloir had contained steep, unconsolidated snow, and I finally spent perhaps an entire hour tunneling through the cornice. 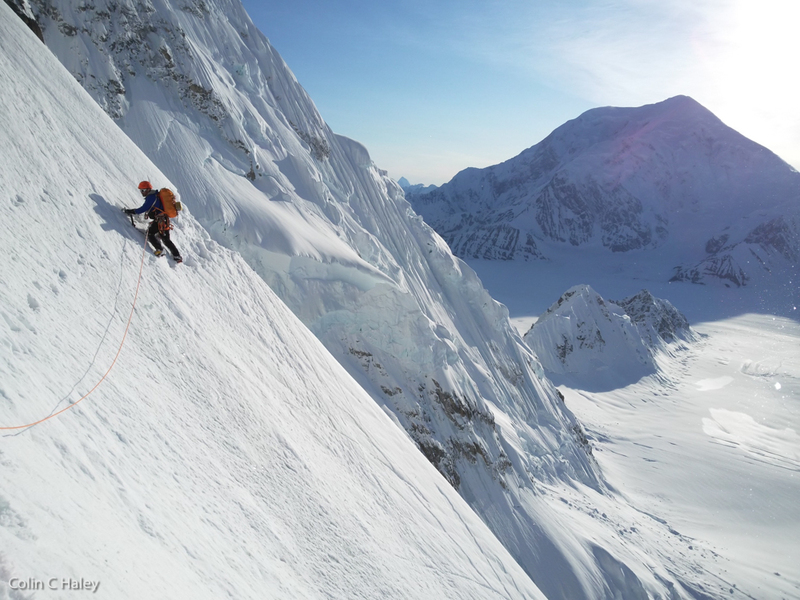 Knowing better this time around, I instead veered up and left, climbing up the classic final ice slope and gaining the crest of the North Buttress in the same spot as the Bibler-Klewin route. I reached this spot, the “cornice bivy,” at 11:53, and was delighted to find a tent platform and fresh tracks in the snow. Three friends I had hung out with down in basecamp, Sam, Keenan, and Mark, had started up the Bibler-Klewin the morning before me, and obviously had made good time. In four previous trips to the top of the North Buttress I had only managed to reach Begguya’s summit once, despite trying hard every time to do so, so I knew to not underestimate the difficult of ascending the upper Northeast Ridge to the summit. 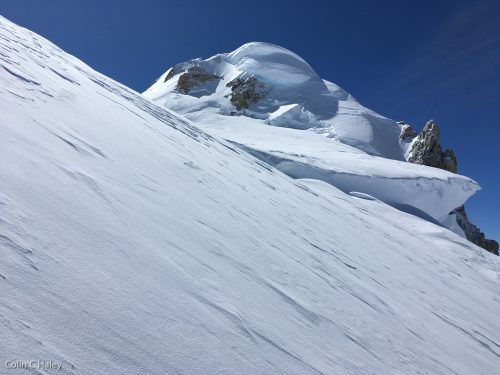 I knew that fresh tracks in the snow would not only make for less effort and a faster time, but also make ascending the upper ridge unroped safer from a crevasse-hazard perspective. After a quick break to eat and drink and leave my helmet cached in a snow hole (I didn’t dare leave my rope cached, even though I knew I most likely wouldn’t need it above), I started gleefully up the ridge, looking forward to cruising along a trail. After a few meters I noticed that some of the tracks looked suspiciously like downhill tracks, and was having trouble spotting the track on the slopes above. A couple minutes later, only about 100 meters of distance and 10 meters of vertical from the cornice bivy, I was disappointed to see the tracks come to an abrupt end at a section of narrow ridge. After feeling briefly disheartened I continued on my way, and actually the crazy purist inside me felt a little bit relieved that I would have to “earn” my ascent all on my own, without any outside help. The low snowpack in the Central Alaska Range this year, perhaps combined with glacial recession, made the upper Northeast Ridge of Begguya a bit more complicated than I remembered it being in 2009, 2011, and 2012. 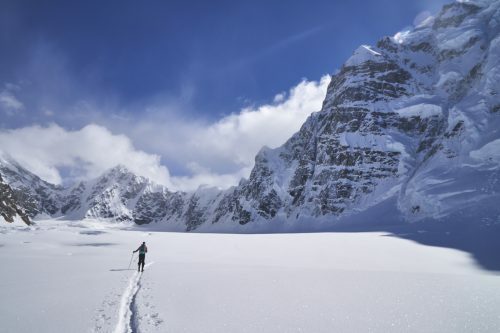 Nonetheless, there were just a few short steps of AI3, and after some short pockets of calf-deep trail-breaking, the snow became pleasantly firm. Most of the snow on the upper Northeast Ridge was boot-top at most, and often less, which is of course a huge boon compared to deep trail-breaking. Once past the steps of AI3 I pulled out my iPod, and enjoyed the non-technical cardio exercise, except for one section of crevasses where I turned off my music and carefully, slowly picked my way through what I thought was the safest possible route (with one high-consequence standing long jump!). I arrived on Begguya’s summit at 14:22, 7:47 after crossing the bergschrund. 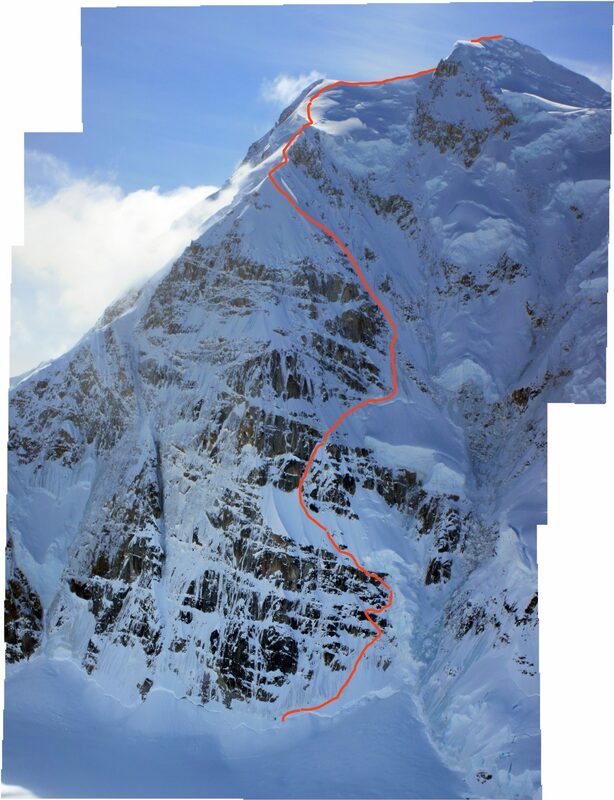 I had felt optimistic and confident before starting, but nonetheless had imagined the ascent taking much more than 8 hours! 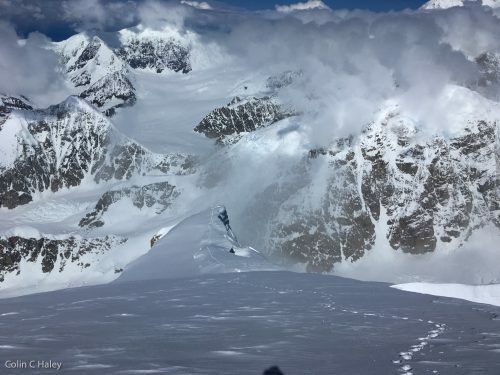 I was delighted with how smoothly and easily everything had gone, and enjoyed the summit of an awesome mountain, one that is visited shockingly infrequently compared to neighboring Denali. After trying unsuccessfully to find a phone signal and call Alisa back in Seattle, eating some food, and drinking some water, I started back down. 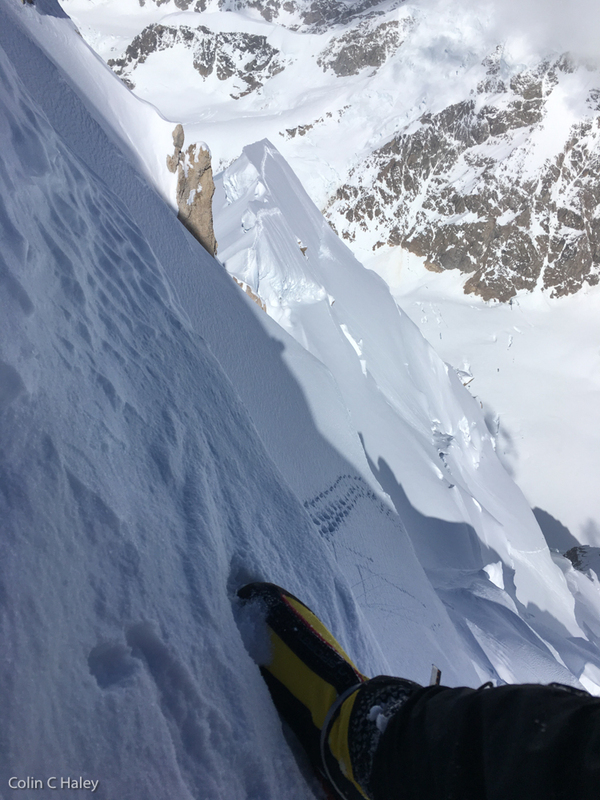 The descent back down to the cornice bivy went easily, with just a few moments of concentration in the crevassed area and while downclimbing the AI3 steps, and unfortunately a building altitude headache. I again took a brief break on the tent platform that Sam, Keenan and Mark had chopped, and then started following their tracks down the Bibler-Klewin, making my first rappel at 16:15. 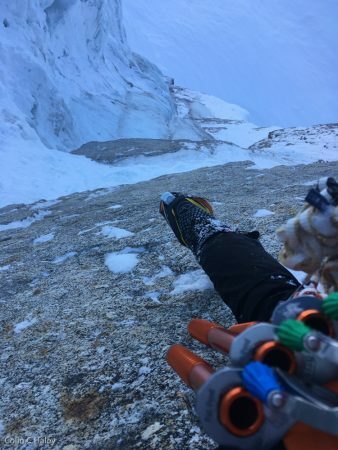 It was certainly helpful that the Bibler-Klewin had been descended just that morning, but since Sam, Keenan, and Mark had made 60m rappels, as opposed to my 40m rappels, I was only able to find and use about 1/3 of their Abalokow threads. 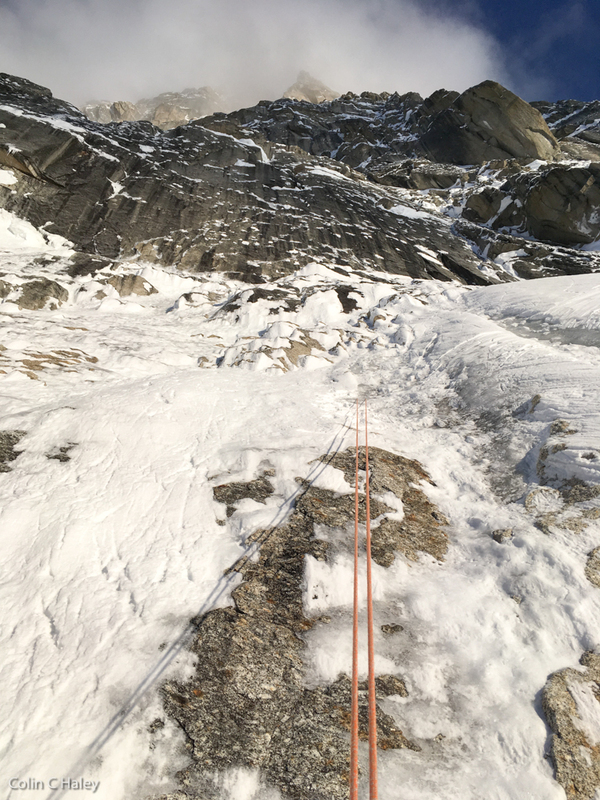 Much of the final ice band had a fair amount of snow stuck to the ice, making finding good ice for Abalokow threads difficult, and down-climbing relatively easy, so after 3 rappels on the upper, iciest bit, I ended up down-climbing most of the final ice band. The rest of the descent was just a long routine of putting in ice screws, making Abalokow threads, putting on my rappel device and prussik, taking off my rappel device and prussik, pulling the rope down, and nursing my altitude headache. I stopped twice during the descent to eat an energy gel and have a a sip of water, but otherwise just rappelled and rappelled. Descending 1,500m of steep terrain with just a single 80m rope of course makes for a lot of rappels, and I would guess that I made about 40-45. 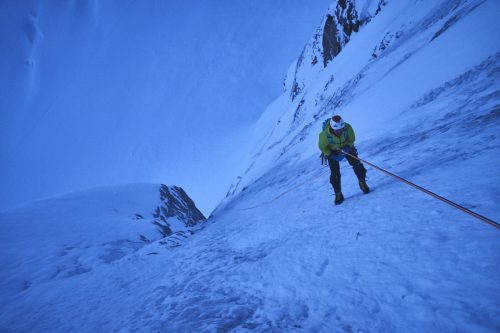 However, rappelling is probably the one type of climbing activity involving a rope that is actually faster alone than with a partner, and by 21:53 I was below the bergschrund walking back to my skis. 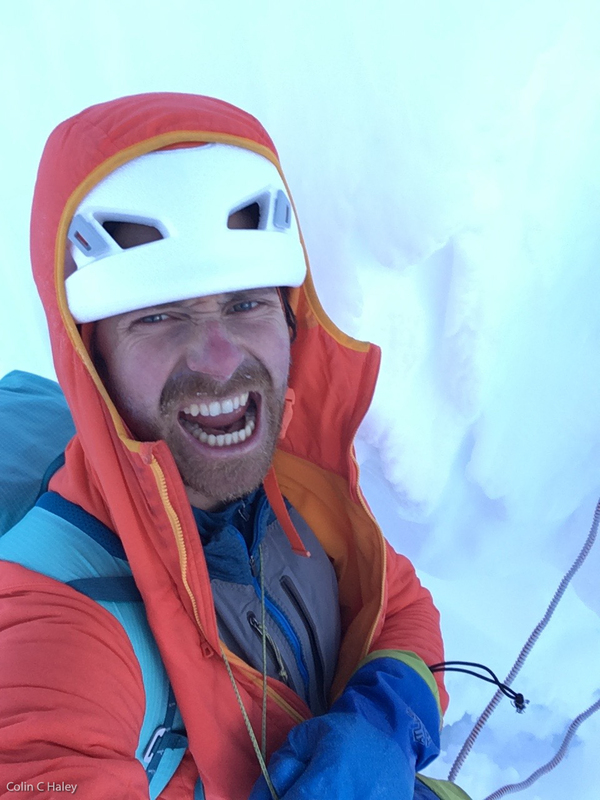 I popped off my crampons, harness, and helmet, and shoved them into my backpack, along with the rope, which I didn’t bother coiling. I put on my skis, adjusted my poles to 140cm for poling power, and at 22:20 was arranging the pink, plastic flamingos in front of Lisa’s tent in a funny way – a signal that I was back safe. I trudged from Lisa’s tent up the hill to mine, put on some music, took off my boots, starting making dinner, and digesting my experience. 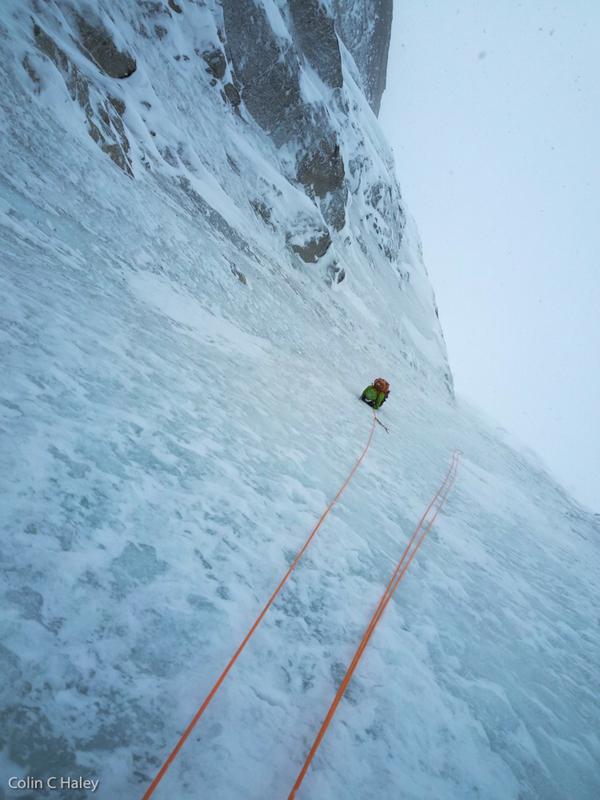 The entire ascent and descent had gone so quickly and easily that I almost immediately started wondering if I had built the objective up in my mind to be more difficult than it was in reality. Compared to my epic the year before on Sultana, the whole thing felt like a walk in the park. 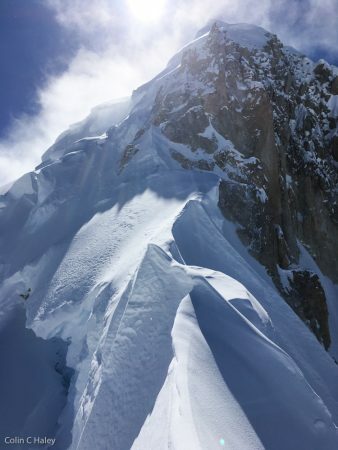 However, while I do think in any event that soloing the Infinite Spur is a greater accomplishment than my recent solo on Begguya, I think it is also easy to conflate an epic with a great accomplishment. 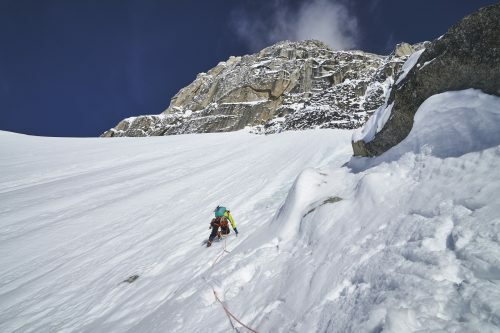 My epic, fight-for-survival descent of Sultana does not make the accomplishment of soloing the Infinite Spur greater than if my descent had gone smoothly, and my casual, shockingly-mellow experience on Begguya shouldn’t undermine that ascent either. 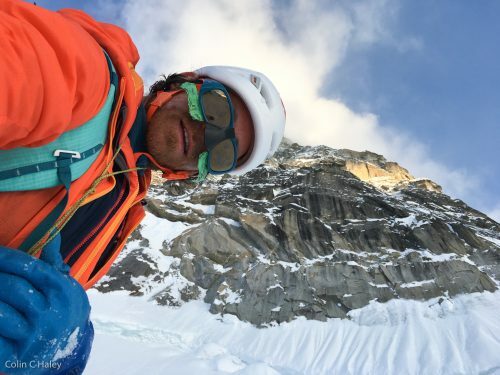 I think that my solo on Begguya set a speed record regardless of what portion is being measured (5:18 bergshcrund-to-cornice-bivy, 7:47 bergschrund-to-summit, 15:22 roundtrip-from-bergschrund, 17:13 roundtrip-from-base-camp). 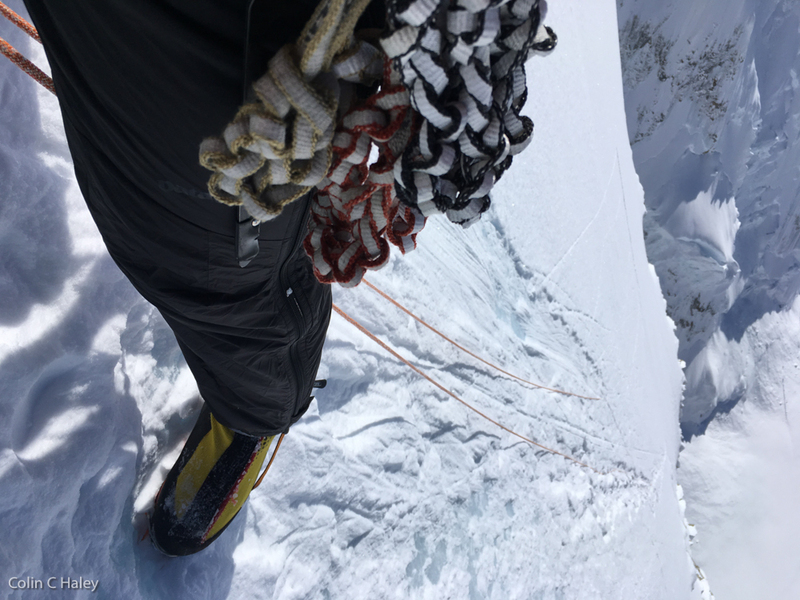 However, climbing ropeless is always so much faster than climbing roped, that it is somewhat pointless to make comparisons to roped parties – Much more significant and meaningful to me is how much faster I was able to climb compared to my attempt in 2012. 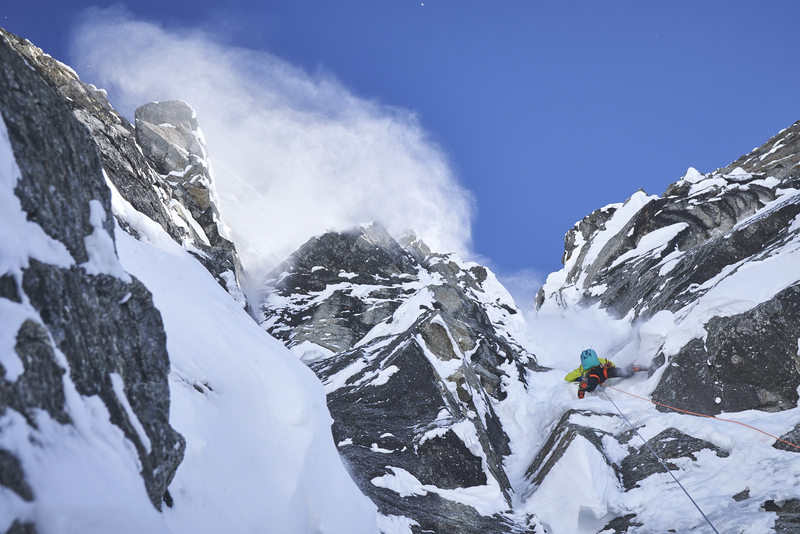 In 2012 I had taken 15:10 from the bergschrund to the cornice bivy – nearly three times as long! There are for sure a number of reasons why I was able to move so much faster a few days ago than I had five years ago, but I’m sure the biggest reasons are that in the past five years I have become both a better technical climber and more fit cardiovascularly as well. 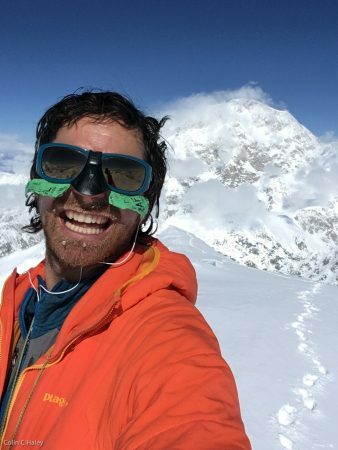 Those personal improvements, and the very direct, quantitative evidence of them, are the most satisfying aspect to me of my recent solo ascent. Aside from being a better climber and alpinist than I was five years ago, I think I was able to move faster this time due to better conditions, better weather, better equipment, lighter equipment, and wiser strategy gained from the experiences of the past five years. The biggest difference in strategy compared to 2012 is that this time I free-soloed everything, while in 2012 I had self-belayed a few short bits. Obviously this change in strategy is only [safely] possible by gaining a higher level of technical climbing ability, but like many changes in strategy it has exponential benefits: 1) Not ever self-belaying saves a lot of time. 2) Not ever self-belaying allowed me to carry an ultra-lightweight static rappel rope, while in 2012 I had carried an 80m twin rope, which is much heavier. 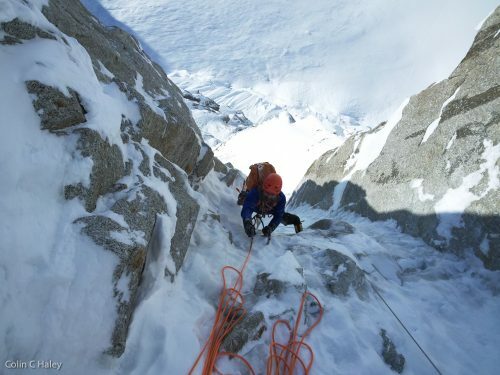 3) Being able to self-belay conveniently, or haul one’s pack on steep sections, requires keeping the rope handy. In 2012 I had trailed the rope behind me for the entire ascent of the buttress (clipped to the middle of it), which, from a energy perspective, is massively less efficient than keeping the rope inside one’s backpack, which I did this time. Another significant change in strategy is that in 2012 I had carried a small stove to melt snow along the way, and a freeze-dried meal as well to eat at the the cornice bivy. All that melting of snow takes a significant amount of time, bringing water to a boil for a freeze-dried meal wastes a bunch of fuel and time, and eating and digesting a freeze-dried meal is slow. 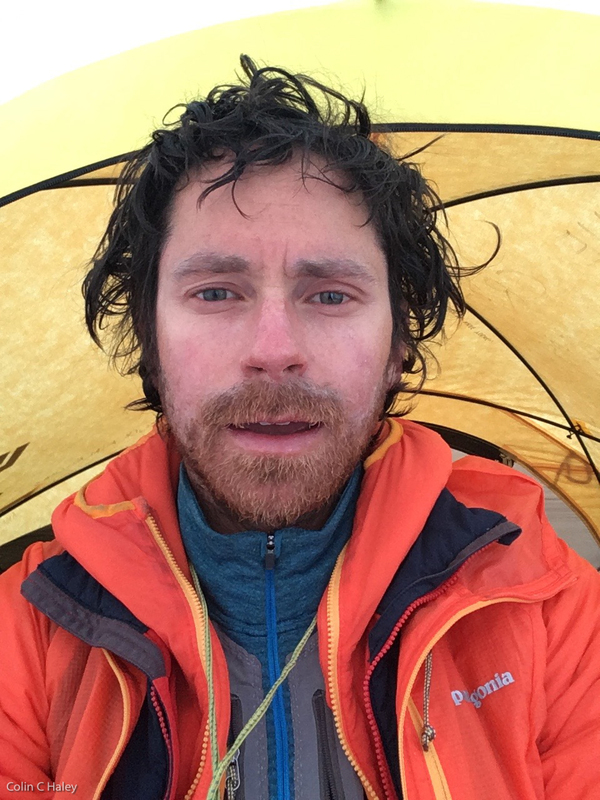 This time I brought only bars and gels, and carried no stove – I filled 4 Platypus bottles with hot water down in basecamp (and insulated them with bubble-wrap, which worked quite well! ), and called it good with those 4 liters of water. 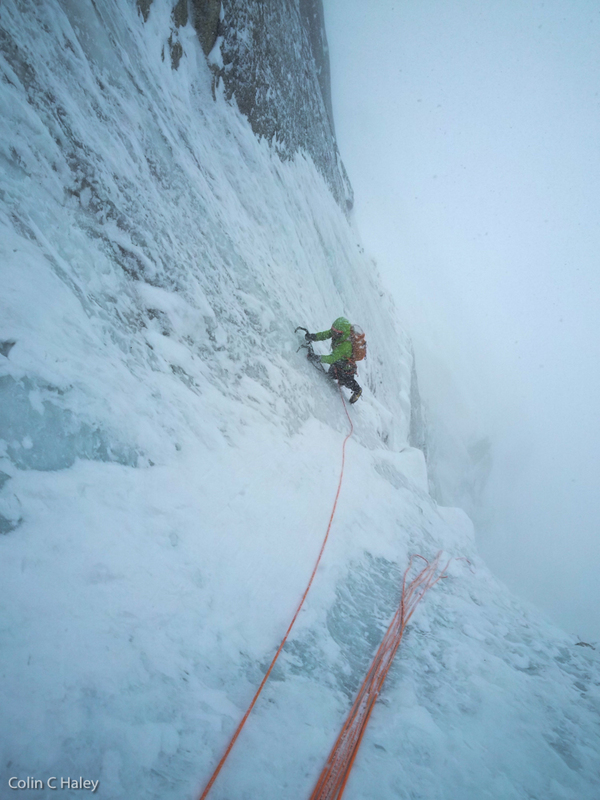 The day after my ascent I hung around basecamp, hemming and hawing about what I should do next. I had some ideas of other things I was interested in trying, and had enough food to potentially stay in the mountains until the end of the month. However, I’m departing for the Karakorum on June 11, and already really missed spending time with Alisa, back in Seattle. Deciding to go home early felt like a slight betrayal of my ambitions, and the FOMO was certainly made worse to be departing with a rare forecast of good weather, but I felt happy and satisfied with what I had accomplished, and certainly have not regretted my decision since getting home. The north face of Begguya from the plane landing Mark and me at basecamp. Mark climbing his own route, Bacon and Eggs. Colin approaching the North Buttress of Begguya for some cragging on Deprivation. Photo by Mikey Schaefer. Colin starting up Deprivation. Photo by Mikey Schaefer. 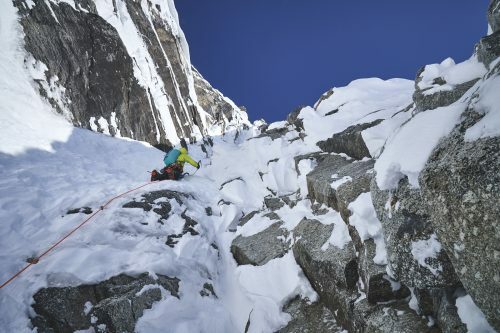 Simul-climbing with the added security of mictraxions, on the lower ice slopes of Deprivation. 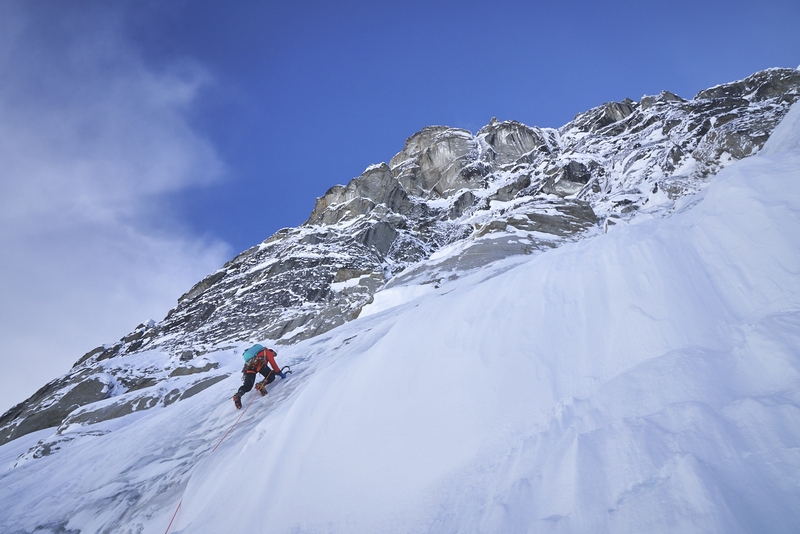 Colin climbing on the lower pitches of Deprivation. Photo by Mikey Schaefer. Mikey coming up to the crux section of Deprivation. Colin climbing the crux pitch of Deprivation. The blue rope is one partially frozen into the ice, abandoned by a siege-style attempt in 2016. While I don’t think it’s very cool that these ropes were left here, I must admit that I readily used it for additional protection on the poorly-protected pitch, which was not in particularly good condition. Photo by Mikey Schaefer. Mikey coming up the crux pitch of Deprivation. Colin nearing the first ice band, on Deprivation. Photo by Mikey Schaefer. 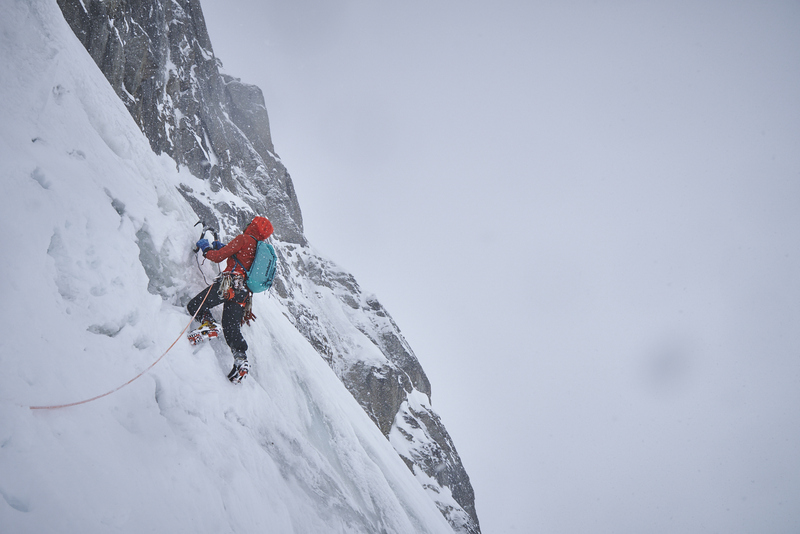 Colin starting a traverse up and across the first ice band, to join up with the Bibler-Klewin. Photo by Mikey Schaefer. 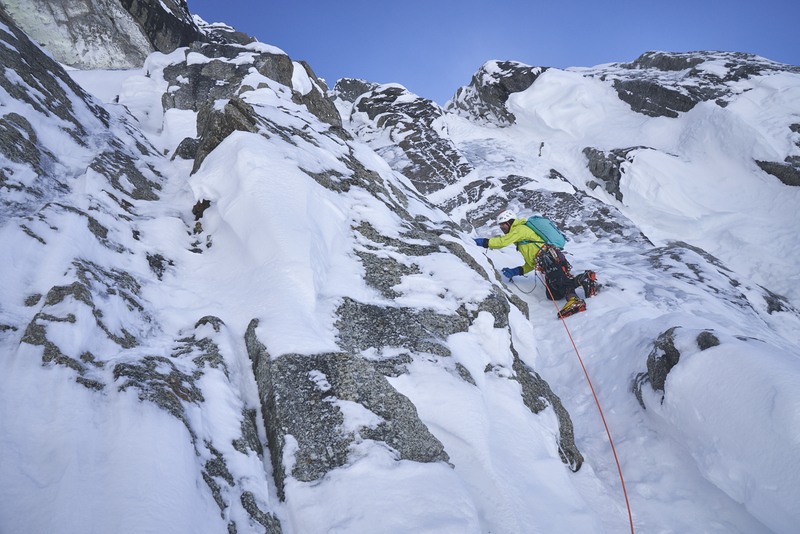 Mikey starting the traverse towards the Bibler-Klewin on the first ice band. Mikey finishing the traverse towards the Bibler-Klewin on the first ice band. Colin rappelling the bottom of the Bibler-Klewin in the dusk. Photo by Mikey Schaefer. Colin’s basecamp scene. Spungus the Tent, AKA The Crazy Fart Castle, has seen a lot of UV radiation, but is still habitable! Colin crossing the bergschrund on the Mini Moonflower. Photo by Mikey Schaefer. 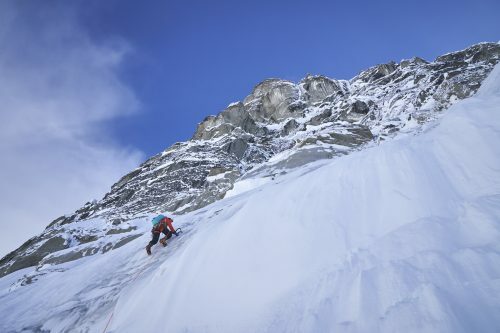 Mikey climbing up the lower ice slopes of the Mini Moonflower. Colin starting up the upper portion of the Mini Moonflower. Photo by Mikey Schaefer. Mikey just past the crux of the Mini Moonflower. 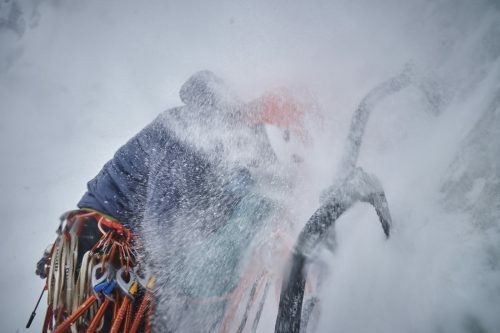 Full-on conditions on the Mini Moonflower. Photo by Mikey Schaefer. Colin climbing through a torrent of spindrift on the Mini Moonflower. Photo by Mikey Schaefer. Mikey arriving to the point at which we started rappelling. Colin pulling down the stuck end of a rappel rope, during the descent of the Mini Moonflower. Photo by Mikey Schaefer. 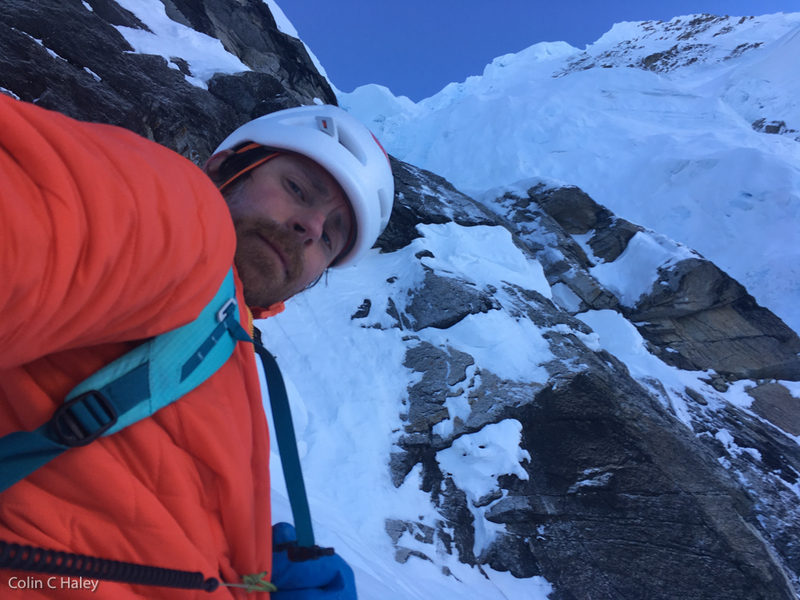 Self-portrait at the bergschrund, about to start my solo ascent of Begguya. Climbing in the first rock band during my solo ascent of Begguya. Probably the most difficult section I climbed during the entire ascent, in the first rock band. One last little step of mixed climbing to finish the first rock band and gain the first ice band. Looking back at my tracks, while beginning a long, rising, leftward traverse on the first ice band. Looking up at Deprivation from the base of the second rock band. A weird-looking self-portrait while nearing the second ice band. 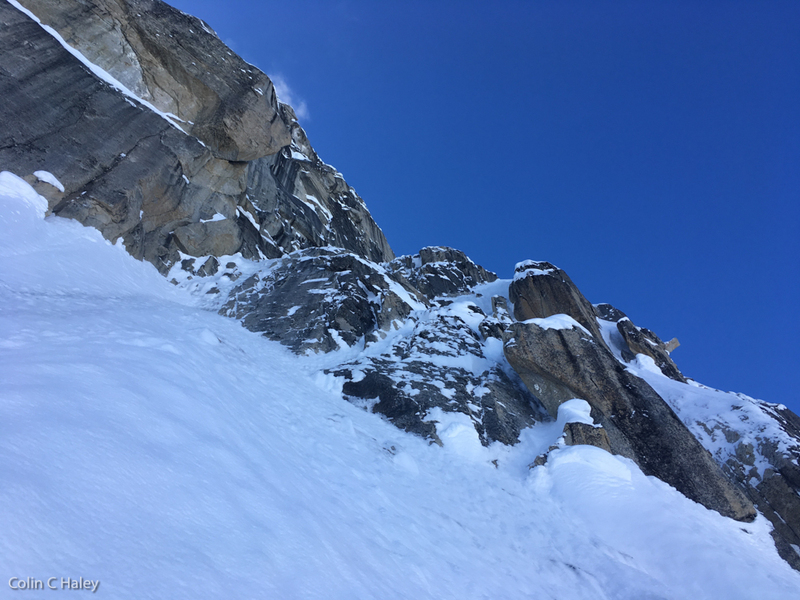 After a long rightwards traverse on the second ice band, looking up the moderate ice that I climbed to join the Björnberg-Ireland route. 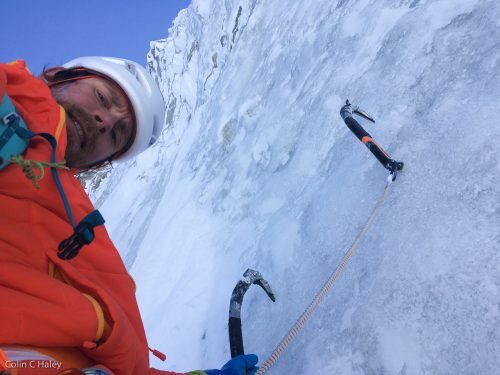 Self-portrait while climbing some moderate ice to join the Björnberg-Ireland route. 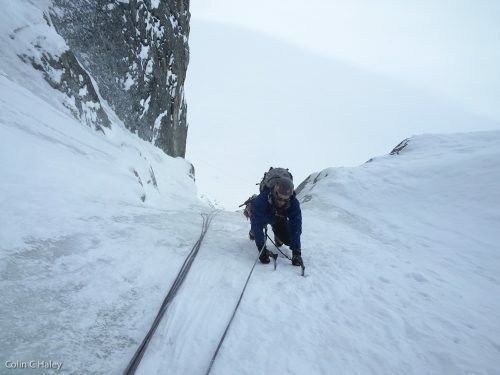 In the upper gully of the Björnberg-Ireland route. Self-portrait as I gained the final ice band. 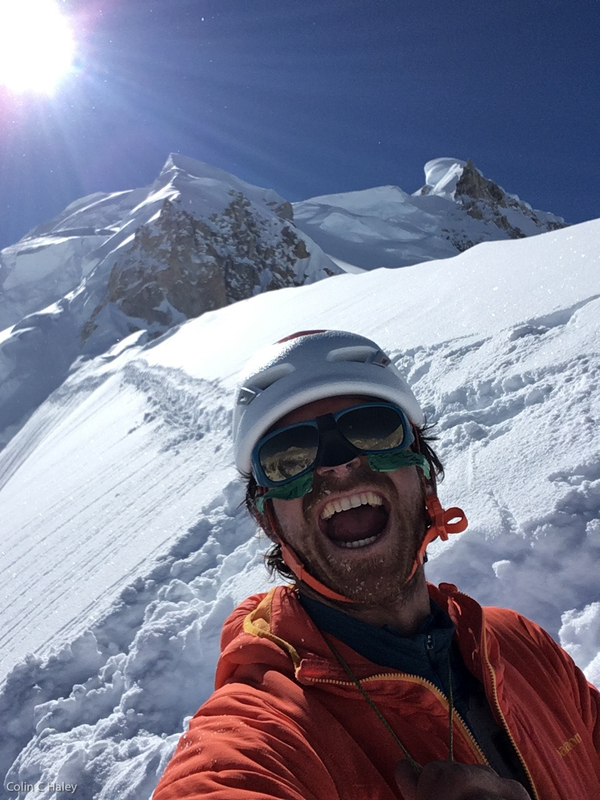 Self-portrait at the cornice bivy, elated because I thought I’d follow tracks to the summit. Looking up the upper Northeast Ridge of Begguya, from where the tracks abruptly ended. Climbing on the upper Northeast Ridge of Begguya. Looking up towards the final summit pyramid. Looking down the upper slopes of the Kennedy-Lowe. Kahiltna Basecamp is visible as a few faint black specks to the right of Annie’s Ridge. Stoked self-portrait on the summit of Begguya. Starting the first of what I estimate was about 40-45 rappels down the North Buttress. One of the last rappels on the lower portion of the Bibler-Klewin. Self-portrait safely down, below the bergschrund. Self-portrait back in Spungus the Tent. 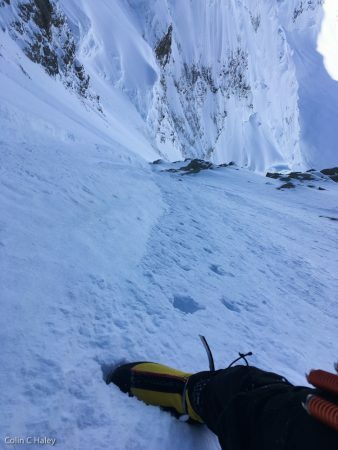 The line that I soloed on Begguya. It is roughly 2000 meters of elevation gain from the bergschrund to the summit. A topo I made after my attempt in 2012, showing various route lines on the North Buttress of Begguya.